Construction of the PVC plant in Kstovo of the Nizhniy Novgorod region, implemented by RusVinyl LLC, is actively under way and continues according to schedule. Actually, piling works are fully completed; concrete laying is near completion, laying of underground pipeline has started. At the construction site framing of production facilities has begun as well. At present, there are 1,000 people working on the construction of the complex and, in the peak period, this number will increase to 2,200 . Also, the first batch of the project large-size equipment arrived at the port of Kstovo region. 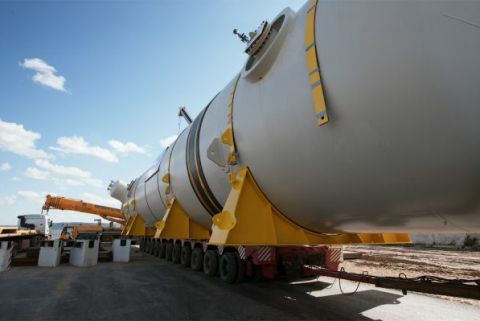 Kuehne+Nagel logistic company delivered two VCM storage tanks by river to the port. The third tank will arrive within the next few weeks. The gross weight of one such bullet is approximately 255 tons; it is 36.5 meters long, 8.75 meters wide and 8.16 meters high. In order to deliver this heavy equipment to the construction site RusVinyl carries out works for improvement and widening of certain sections of roads.